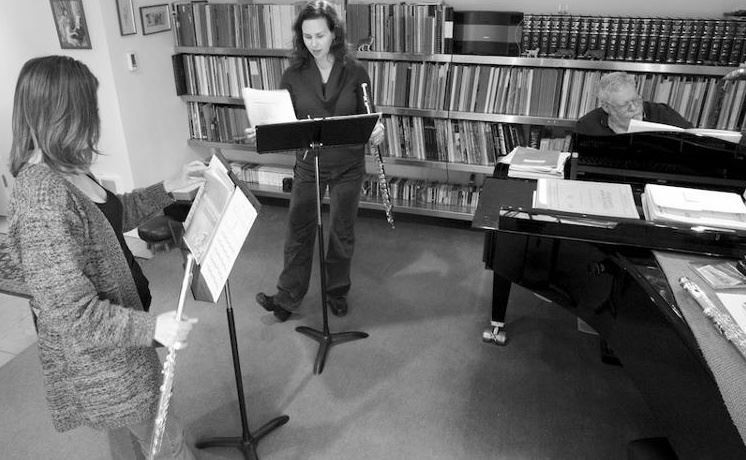 It was sometime in 2009, and flutists Amy Likar and Rena Urso-Trapani were sitting in a rehearsal in their orchestra, the Oakland East Bay Symphony when each got the brilliant idea of putting together a chamber ensemble. They talked about it for a while, tossed around some ideas, brainstormed on names for the group, what repertoire they’d do, and where they could perform. What contribution could they make to the chamber music world as flutists that a zillion others weren’t already doing? A conversation with their favorite San Francisco collaborative pianist Miles Graber was all that was left in order to seal the deal; just like that, the Alcyone Ensemble was born. The Alcyone Ensemble is not your average two-flute-and-piano ensemble. They truly think outside the box and try to push creative boundaries all the time. 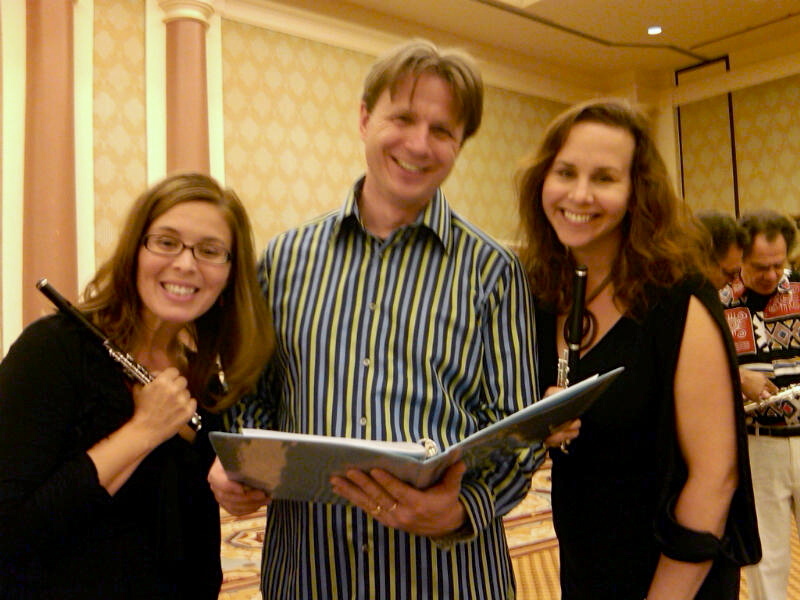 Seriously, how many 2 piccolo and accordion groups have you heard perform recently? If you’ve been to an Alcyone Ensemble concert, then chances are you’ve heard one! 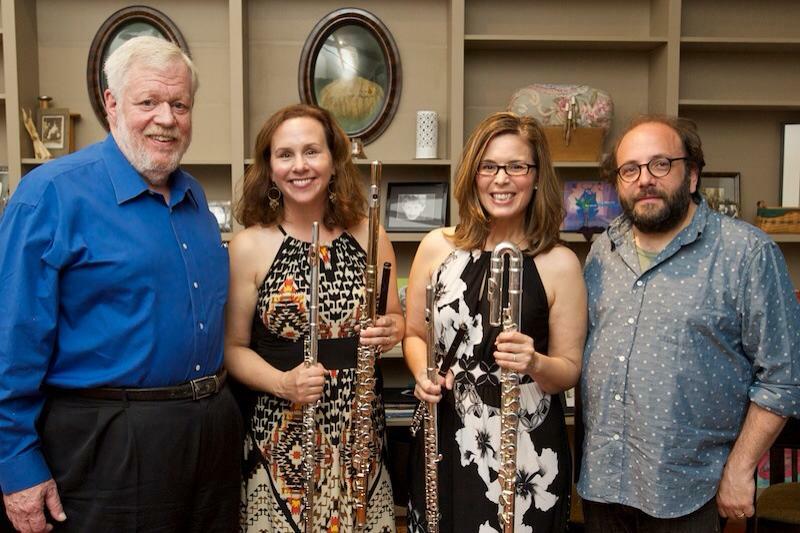 Some memorable recent performances include Trinity Concerts in Berkeley, CA, the Annual “Bach and Brew” for the Oakland East Bay Symphony, and the National Flute Association’s Annual Convention in Las Vegas and Chicago. 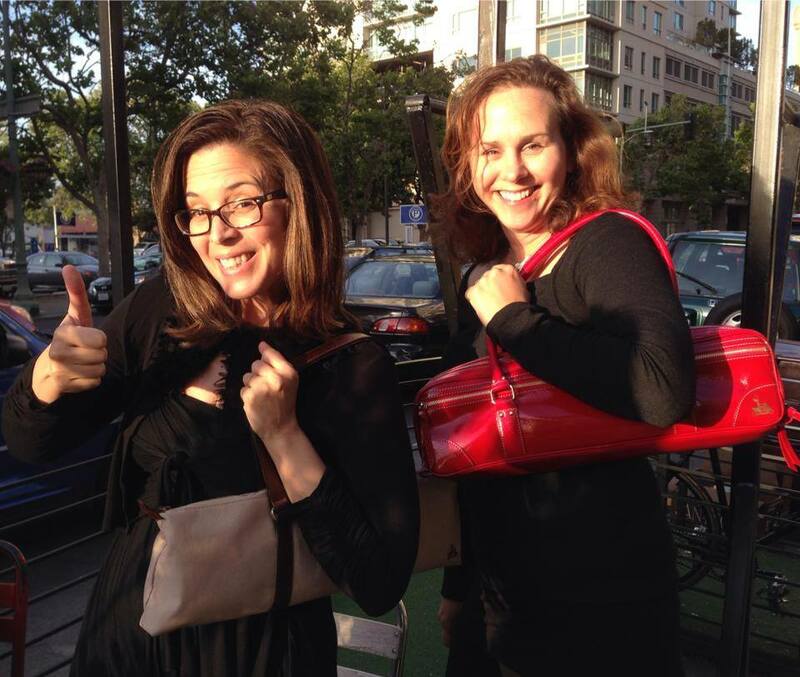 This fall, they’ll appear on the “San Francisco Music Thursday’s” at the Center for New Music. 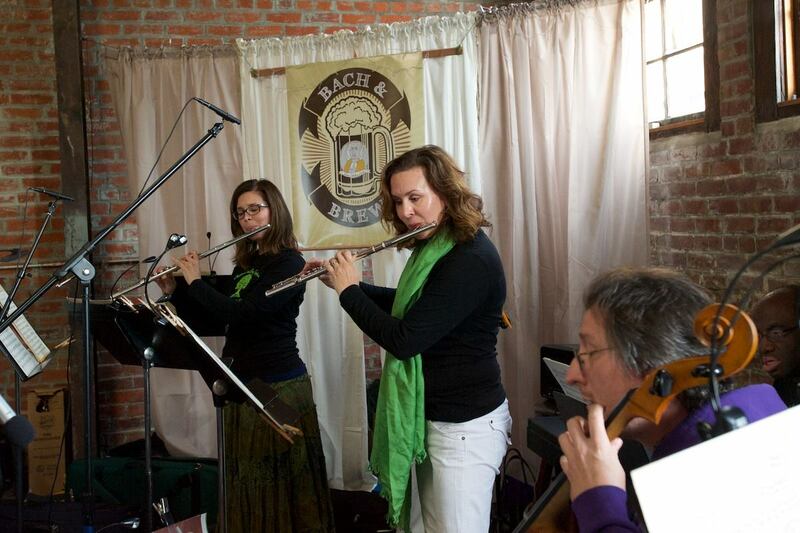 Rena and Amy performing trio sonatas of JS and CPE Bach at the Annual OEBS Bach & Brew. What else makes this collaboration unique? Amy and Rena are both Licensed Andover Educators and travel throughout the US and abroad presenting Body Mapping classes. Amy & Rena at the Biennial Andover Educator Conference at Iowa State University. Miles, Amy, Rena, and Danny after the premier of Blister and Wow. As much fun as it is to learn brand new works, Alcyone also loves to keep the tried and true classics of J.S. Bach, C.P.E. Bach and Doppler in their regular rotation. 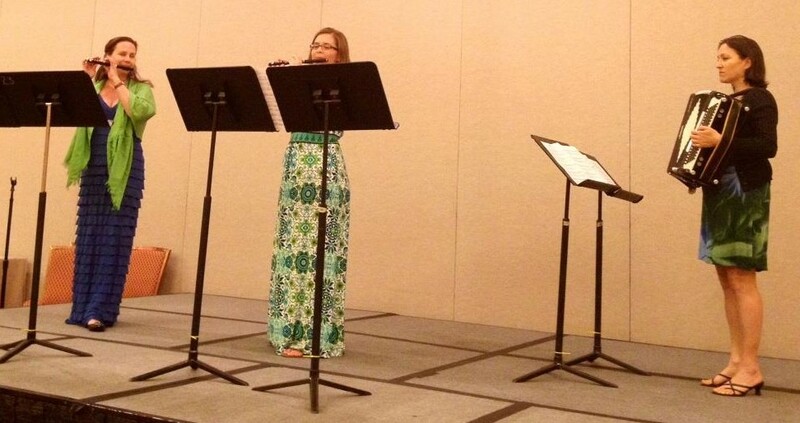 Rena and Amy enjoy performing Baroque period works on their modern flutes with wooden head joints. Just their little way of giving a nod to the style and sound of the beautiful, Baroque flute. Alcyone Ensemble receives fiscal sponsorship from San Francisco Friends of Chamber Music, and is honored to be a part of their affiliate program. If you would like to contribute to future commissioning projects or concerts, please click here to make your tax deductible donation. Be sure to choose “Alcyone Ensemble” in the pull down menu … of course!